Our very first release of Trainz in 2001 carried the tagline “Virtual Model Railroading on your PC”. To celebrate 15 years of Trainz, our next full edition, “Trainz Model Railroad 2017” (TMR17), will be released on the 15th Anniversary of the original "Trainz CE" release (on both PC and Mac). So make sure you put December 4, 2016 in your diary for this special day! We've come a long way in those 15 years, and we thought this would be a good time to provide a broad overview of the entire "Trainz" concept - especially for those who may not known about Trainz way back then. We know there are many people out there who love trains, love watching trains, and love the whole concept of letting their imagination run wild in a world full of trains. Every one of those people know what a model railroad is, and understand there are many different aspects to it - building, operating, collecting etc. This article will help explain more about the "virtual" hobby and give an insight into what can be done in the 3D world. Back in 2001, Greg Lane, who conceived the original vision for Trainz said: "Trainz is a unique product with appeal beyond traditional games boundaries. It replicates the many different aspects of model railroading. It immerses players into the driver's seat of their favorite locomotives and allows them to create a huge variety of layouts using hundreds of textures and objects from around the world. Plus they can collect a wide variety of their favourite locomotives and rolling stock to enjoy." The "model railroad" aspect of the tagline did create a little confusion about the product. Some people thought we were trying to model "model" trains. In fact, Trainz was more about borrowing that same sense model railroaders have of "build it, operate it, imagine it's the real thing, and simply enjoy your piece of railroad heaven". Just like the physical hobby many people have enjoyed for years, Trainz is a hobby that involves recreating real life railroad environments and then operating trains within that environment. The big difference between the virtual and real world hobbies is there are far fewer constraints on the virtual hobby. The real world modellers have limitations imposed by the physical aspects - primarily budget, space and time. The Trainz hobby requires use of a computer keyboard rather than any handycraft skills. You can lay track with a few mouse clicks, saving many hours (and dollars) in the process (in fact you can lay unlimited track without spending another cent). And when you want to check out your creation, you place down a few trains and check out your trackwork - then after driving a while, you can extend your layout without using a saw to cut through the wall of the spare room! We’ve worked out that recreating just one of the routes included in TMR17 in the real world would cost over $10,000 (and that assumes you actually have the space required since some of these “layouts” are industrial in both scale and nature). 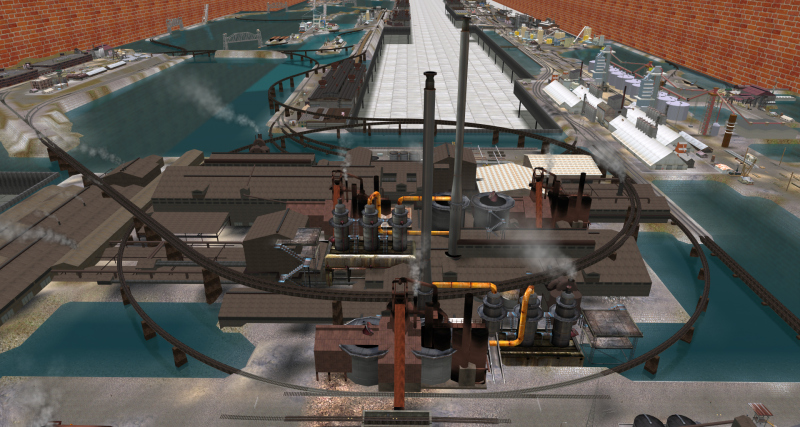 Trainz is not all about "creating". For many people, the real fun starts in the "Driver" module. Using your mouse and "hotkeys" to control the trains, you can check out the action from a variety of viewpoints. You can switch from train to train with a mouse click. You can place one, two or even 200 of your favourite locos on the tracks. You can provide "orders" to AI drivers to take trains wherever you want them to go. Watch them head off to industries, pick up passengers, stop at signals and toot their horns. Inside this “virtual world” you can even jump inside the cab for a view just like a real train driver (and operate the animated cab controls as well). It is important to note that our trains aren’t “model” trains - they aren’t made out of plastic or metal, but are made out of polygons and textures. We are close to the point where our human perception limits are being reached and it is sometimes hard to determine if an image is of a 3D model or a photograph of the real thing. The driving physics simulation offers a choice of simple speed controls or fully fledged realistic simulation that includes power and brake curves, coupling tension and much more. Something new we have done for TMR17 is that all the included routes have been made to look like they are indoors. When you zoom out, you feel like you are looking at a model train set. But when you zoom in or jump in the cab, you're back in the "real world" of trains. We have made this decision primarily for nostaligic reasons. People who love trains tend to also love model trains. Many of them have had a trainset at one time in their life but for various reasons (wife, family, job, money, moving house etc) they no longer have a model trainset. TMR17 gives those people a new opportunity to get into a hobby involving the world of trains, but at a fraction of the price of the physical hobby. This "mode" is actually what I wanted but didn't have the imagination to pull it off. Boy! talk about opening up Trainz to a whole new branch line, WOW!! Even in virtual reality such a concept also has advantages. It allows reaching nice looking results much faster [...] only a small strip of land needs to be decorated [...]and the route creator can pay nearly all of his attention in detail creation to the terrain near the tracks. Nice shots everyone! Looked fun, thought I'd take a stab at it. A lot more fun building it than I thought! So in summary, your imagination is really the only thing governing how much you put into, or get out of, this virtual hobby. You can start out small, just like when you built your first loop of track on the lounge room floor, and then if you have the time and patience, you can end up building all 393 track miles from London to Edinburgh (as one group have already done, available in our "Trainz A New Era" version). Whether your route is surrounded by walls or is "open air", it is YOU that really determines the level of realism and scale. So we hope you will enjoy this new dimension of railroading as much as we do!